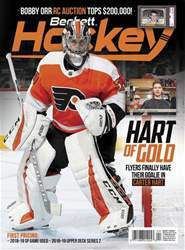 Digital Subscriptions > Beckett Hockey > April 2019 > SOLD! 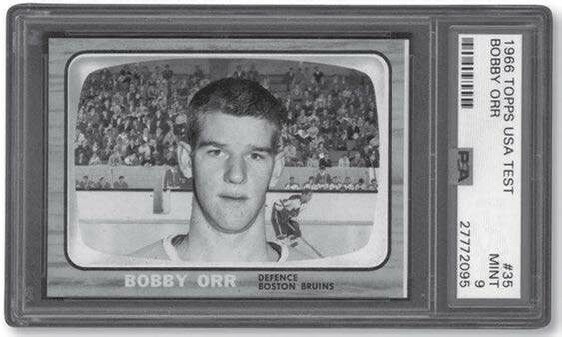 Forty years into retirement, Bobby Orr continues to rewrite the record books. It was expected that this card, the finest known copy of the USA Test version of his RC, would draw intense interest at last month’s Lelands auction, but few were prepared for this finale. The sale represents the second-highest price ever paid for a hockey card, behind only a PSA 10 copy of Wayne Gretzky’s 1979-80 RC that was hammered down for $465,000 in 2016. The Test set was a regional release produced to gauge American interest in hockey cards. Production of the series was extremely limited, with distribution aimed primarily at California, home to expansion teams in Los Angeles and Oakland. The cards look very similar to the standard Topps issue (which was produced primarily for Canadian collectors), except the wood-grain borders are noticeably lighter and the card back information is in English only.